Set in the 17th century, the 3 Musketeers Premiere Dinner Adventure promises to be an exciting show that incorporates a tale of gallantry with rousing sword battles , romance and comedy. Hold on to your handlebar moustaches, fellow musketeers! En Garde! How are Your Fencing Skills? Come and see the 3 Musketeers Premiere Dinner Adventure and enjoy Alexander Dumas’ tale as it comes to life before your eyes! Join d’Artagnan as he embarks on a mission to join the Musketeers of the Guard. Be a witness as d’Artagnan meets Athos, Portos and Aramis. See the engaging sword duels. Fall in love as d’Artagnan gets enchanted with the lovely but elusive Constance Bonacieux. Get outraged by the evil plotting of Cardinal Richelieu. A comedic donkey, three horses and dogs add that touch of animal humor as the talented crew and actors create an exciting tapestry of sight, sound and drama onstage. Occasionally, the cast members of the 3 Musketeers Premiere Dinner Adventure approach the audience to pick participants in the stage play that unfolds. A royal maiden needs to be kept safe on her wedding voyage. Can the lovely maiden outwit the conspirators who are out to disrupt her journey to join her beloved? Will d’Artagnan, Athos, Portos and Aramis be able to hold out long enough and fight as one to save the day? It is up to you, d’Artagnan and the 3 musketeers to make sure that happens. Or just sit back and watch all the rip-roaring action take place inside the Pirates Dinner Adventure arena. See this tale of bravery live while enjoying an excellent menu that is a true French feast. Yes, the 3 Musketeers Premiere Dinner Adventure can be enjoyed while indulging in French cuisine. Start off with a selection of a House Salad of fresh and crisp garden greens with a lovely-textured house dressing. Or choose the special Cream of Vegetable Soup to coat your palate in preparation for the lovely main course just ahead. Watch the drama unfold onstage as you take a bite or a slice of the Roast Chicken Breast marinated to perfection with savory seasonings. Or go for the succulent Beef Tenderloin done in swashbuckling musketeer style. Both options are accompanied by seasonal vegetables. Polish all that off with Apple Cobbler a la Mode, an extravagant dessert that comes with creamy vanilla ice cream. Vegetarian menu is available, too. Children can partake of the Captain Kid’s meals that include Macaroni and Cheese and Chicken Nuggets. You can wash it all down with Ice Tea for the meal during the main show. The Cash bar is kept open the whole time. There’s more good news. 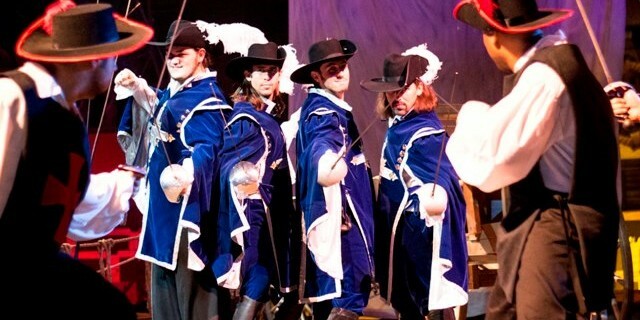 The 3 Musketeers Premiere Dinner Adventure can be enjoyed by groups of various ages. Special group rates apply for guests when they come in with 15 or more members. The arena style setting comfortably seats up to 425 guests. Group bookings done in advance are also given priority seating and special beverage packages of their choice. The special group rates are inclusive of gratuity, state taxes and handling fees. So get ready for a flamboyantly good time. Ready your sword and come to the 3 Musketeers Premiere Dinner Adventure now!